Learn about announcements and other news from the KCI Expo Center. Flyte Systems announced The Holiday Inn KCI Expo Center will install its FlyteBoard hotel flight information airline schedule system that also displays events for the KCI Expo Center and hotel meetings. The FlyteBoard shows real-time arrivals and departures at Kansas City International Airport with Doppler Radar for maximum guest convenience. 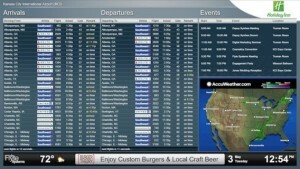 FlyteBoard is developed by Flyte Systems, the leading provider of cost effective airport travel information. The modern 141-room Holiday Inn is directly connected to the KCI Expo Center, one of Kansas City’s premier meeting and event facilities. The property is near Kansas City International airport and is undergoing a multi-million dollar renovation that includes its newest outlet, Burger Theory. A chic hamburger experience that features local craft beers and a fun outdoor patio area for relaxed dining.